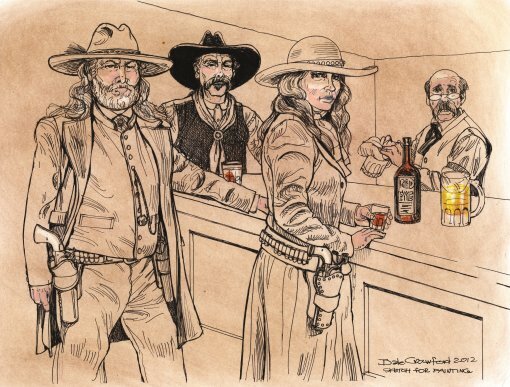 Artist: Wild Bill Whedbee a.k.a Dale Crawford: "The Bar Scene"
I got interested in cowboy action shooting early in 2000. My brother-in-law and I decided to give a try and have been playing the game every since. The people, the guns, the clothing (costumes) and did I mention the people make this game a lot of fun. 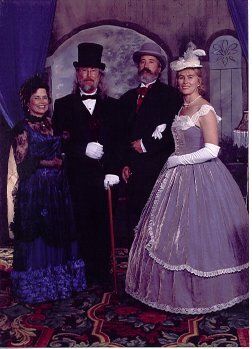 My alias, Marshal Jack Murphy, came about because I want to take on the persona of one of my relatives. My great-grandfather immigrated from Ireland sometime in the 1870's and moved to Vail, Colorado. His name was John (Jack) Joseph Murphy so I choose Jack Murphy as my alias. My great-grandfather wasn't a marshal but I thought I needed a title so decided on Marshal Jack Murphy. When I started I was shooting in the traditional class (two handed) until I felt comfortable with the competitions. I then decided to charge to shooting dueliist (one handed) and soon changed to gunfighter (a gun in each hand). I am not fast or that good but I look good when I shoot. Here I am at Hell on Wheels shooting stage 1 in 2011. Marshal Jack Murphy in action on stage 1 at Hell on Wheels 2011.